A Sherlock Holmes movie from the silent era that was feared lost for many years is to be released on region 1 DVD this July. American video distributor Kino International will be releasing a reconstructed version of Sherlock Holmes (1922) on its own and as part of a four-disc John Barrymore collection alongside Dr. Jekyll and Mr. Hyde (1920), The Beloved Rogue (1927) and Tempest (1928). 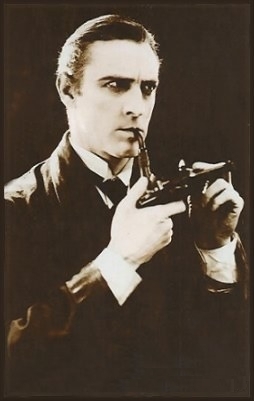 The film, titled Moriarty in the UK, was believed completely lost until, in the mid-1970s, a number of negative reels were located at the George Eastman House film archives and pieced back together by film historians Kevin Brownlow and the late William K. Everson, with the aid of director Albert Parker. “Far more astounding than the film itself are the conditions under which it was preserved. A few years ago all that existed of this film were rolls and rolls of negative sections, in which every take – not every sequence, but every take – were jumbled out of order, with only a few flash-titles for guidance, and the complications of Roland Young with a moustache in some scenes, without in others and a script that in many ways differed from the play, adding to the herculean task of putting it all together. Kino’s release, mastered from the 35mm George Eastman House Motion Picture Department restoration, is still incomplete – an estimated one and a half reels of footage are still missing – but the gaps are plugged by intertitles and production stills. Click here to pre-order Sherlock Holmes from Amazon.com, or here for the John Barrymore Collection. N.B. These DVD releases are Region 1 only. Details of the next Kaleidoscope event, scheduled for June, have been announced. According to the classic television organisation’s Adrian Petford, the themes for the day are ‘Yorkshire Television – A Tribute to the End of an Era’ and Television Continuity. Writing over on the Mausoleum Club forum, Adrian gave the following details. “Celebrating all the bits before, after and during the programmes we will be joined by guests Maurice Kanarek (former Presentation Director for BBC and ATV), Norman Tozer, Mike Prince and Wes Smith who worked as in-vision continuity announcers and presenters at ATV, Thames and others. Kaleidoscope, which is supporting the Royal National Lifeboat Institution throughout 2009, has also published a full schedule for the event, to be held in Stourbridge, West Midlands. * 12:00 pm ATV start-up film voiced by Norman Tozer. * 12:05 pm The Big Show – from the opening night of Tyne Tees Television, this show features Dickie Henderson, Bill Maynard, Virginia McKenna and Bill Travers. Also including part of the advert breaks before, during and after the programme. * 1:00 pm Rest Assured – an untransmitted pilot episode for a seventies sitcom derived from Coronation Street. * 1:30 pm Jackanory – “The Dribblesome Teapots” part 2, read by Kenneth Williams. * 2:00 pm Guest Panel – And Coming Up Tonight – Maurice Kanarek and Norman Tozer are the first guests on our Continuity Panel. Maurice was a Presentation Director for both the BBC and ATV. Norman was a continuity announcer for ATV. This panel will include examples of their work rescued from skips and house lofts, including some wonderful trailers for It’s a Knockout, Detective and Juke Box Jury. * 3:00 pm Our Finest Idents – Kaleidoscope has trawled the broadcaster archives to find master tapes of surviving idents and continuity never seen before. Highlights include ITV’s 1969 Christmas promotion and brand new 35mm transfers of specially made closedown features. * 3:15 pm Guest Panel – Later On… We Will Be Joining – Our Continuity Panel continues with guests Mike Prince and Wes Smith. They worked for ATV and Thames Television. They bring with them favourite moments from their personal collections including the final broadcasts of ATV. * 5:30 pm New Zealand Censor Clips – recovered from New Zealand in 2009, this short reel of 16mm clips – censored from the original programmes due to content – contains previously missing footage from The First Lady and Emergency Ward 10 amongst others. * 5:45 pm Man of Destiny – the sole surviving reel of the earliest ITV play to be recovered, previously presumed lost. It was located by our very own Simon Coward in 2008. This adaptation of George Bernard Shaw’s play features James Donald, Elizabeth Sellars and George Colouris. * 6:00 pm The Masterspy – William Franklin and the late Clement Freud star in the classic mystery quiz game, the only edition that survives on original Quad tape (TX: 14/07/1979). * 12:05 pm The opening ceremony of Yorkshire Television – the opening of Yorkshire Television’s new studios in Leeds is attended by John Stonehouse and wife, the Earl of Scarborough, Harold Wilson, Stuart Wilson, Laurie Higgins, Sir Richard Graham, the Duchess of Kent and Donald Baverstock. This was the first programme broadcast by Yorkshire Television and was followed by Test Match Cricket from Headingley. * 12:10 pm First Night – Bob Monkhouse hosts the variety spectacular that launched YTV, also featuring Frankie Vaughan, Daniel Remy, Toni Lamond and David and Marianne Dalmour. * 1:00 pm Made in Yorkshire. It’s 1968 and Yorkshire, the largest county in England, is to get its own television station. Michael Parkinson pays his own personal tribute to his home county, which is entering a new era of growth and development. The programme includes specially shot footage of various Yorkshire landmarks, cities and landscapes, plus filming of the new television studios being built on Kirkstall Road (including interiors of the new offices and studios, with staff at work). * 1:30 pm Castle Haven – from Emmerdale Farm’s creator Kevin Laffan, the sole surviving part episode of this seventies YTV soap opera stars Jack Carr, Gretchen Franklin, Arthur Hewlett, Roy Barraclough and a pre-Tiswas Sally James. * 2:00 pm Funeral Games – Michael Denison, Ian McShane and Bill Fraser star in this play by Joe Orton. * 3:00 pm Daddy Kiss It Better – starring Michael Craig, Dilys Laye and Hilda Braid, this play was directed by former Kaleidoscope guest Christopher Hodson. * 4:00 pm The Root of all Evil? – “What’s in it for me?” From the pen of Anthony Skene, this play features Jean Marsh, Ronald Allen and George Layton. The theme music was composed by Ron Grainer and the programme ends with two YTV end captions, one of which was never used on air. * 5:00 pm Dear Mother… Love Albert – “The Delegate” – comedy series starring Rodney Bewes (TX: 16/05/1970). * 5:30 pm Mr Moon’s Last Case – based on a book by Brian Patten, this fantastical children’s drama stars Stratford Johns and is narrated by Alun Armstrong. * 6:00 pm Starring John Moulder-Brown… chosen by Sue Tibbles, winner of our Christmas auction in 2007, we present Victorian Scandals – “Skittles”. John Moulder-Brown heads a cast also featuring Maureen O’Brien, Julian Fellowes, Jonathan Coy and Simon Callow in this historical drama. The event runs from 12pm – 7pm, Saturday, June 6th, at the Amblecote Room, Stourbridge Town Hall, Crown Centre, Stourbridge, West Midlands, DY8 1YE. Admission is free and for more details visit the Kaleidoscope website here.